I’ve spoken there before, and it’s always a huge amount of fun. Great facility, great folks. 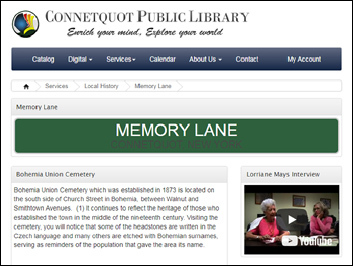 And I’ve looked before at what the Connetquot Public Library does as part of its commitment to genealogy and family history research. But until yesterday I’d overlooked one thing the Library is doing that can serve as a model for all of us in preserving the stories of those who’ve gone before. Just reading the titles is enough to bring a smile to any genealogist’s face, and listening to the stories — watching the videos — reviewing the additional resources suggested on each page — well, it’s a treat. But here’s the bottom line: we could and should all be doing exactly what the Connetquot Public Library is doing. With a video camera or even just the video from our tablets or cellphones, we too can record the history of our families, our neighbors, our neighborhoods, our towns. By taking the time to listen, to add the pictures, to record the videos, to add the references, to tell the stories, we can preserve this history before it disappears. We can make sure that when our youngsters are ready to take the journey down Memory Lane, there’s a Memory Lane there for them to walk. Nice job, Connetquot Public Library. Judy, what a wonderful idea! May I have your permission to forward this blog post of to our local libraries in Bucks County, PA where I live? I am not sure I should do this without first obtaining your permission. Some of my cousins have deep roots here in Bucks County going back to colonial times. Yes you may, and thanks for asking!